“Apart from the presence of novel drug formulations in the late stages of development, the rising awareness of ED is increasing across the globe as it is an underdiagnosed and undertreated disorder. To overcome the lack of awareness regarding the conditions that lead to ED, several organizations, healthcare agencies, and government bodies are also focusing on improving the quality of life of the patients, which will boost the growth of the global erectile dysfunction drugs market,” says a senior analyst at Technavio. 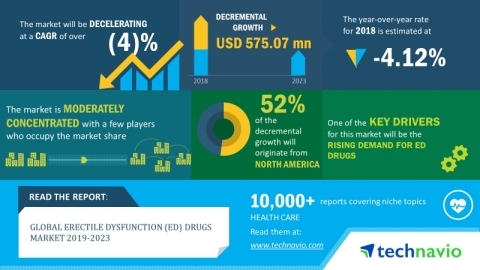 More From BioPortfolio on "Global Erectile Dysfunction Drugs Market 2019-2023| Presence of Novel Drug Formulations in the Late Stages of Development to Boost Growth| Technavio"